A typical Nautaline houseboat cruiser. I have had the pleasure of living on board a 48 foot Nautaline houseboat cruiser for the past several summers, which is based just north of Toronto. As much as we love this house boat, it is beginning to show its years and wear even though we have coddled her to death. I'm looking for another one or anyone who knows of another manufacturer of houseboat cruisers as comfortable as the Nautaline. The Nautaline's are ready to get up and go like hell if you have an emergency which we had a couple of years ago. They are a great fiberglass hull with speed if you need it. I am also wishing to be in contact with anyone who owns these cruisers to help with hard to find parts.....thanks. Well Jimmy, glad to hear that you have really enjoyed the Nautaline houseboats. I know that they are excellent boats, however they are getting fewer and fewer around. As to finding other houseboat manufacturers similar to the Nautaline, you could try Gibson houseboats, or similar makes like Harbor Master, Burns Craft, Holiday Mansion, Chris Craft, Whitcraft, just to name a few. As to finding parts, they are getting rare and more difficult to find, but I'm sure some of our readers can guide you in the right direction. 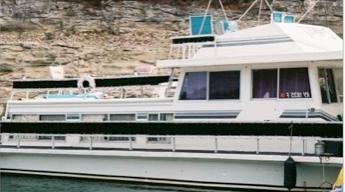 Lastly, hopefully some of our readers will share and post comments about their Nautaline houseboat experiences. Feel free to use the "Click here to post comments." link found at the bottom of this page. I have a 43ft Nautaline, and love the boat. It’s been equipped with a turbo diesel Perkins, and Simplicity Marine surface piercing drive system. I’m in the process of converting the interior to better suit our needs, and there’s an abundance of original parts/pieces aboard that aren’t being used. I have a 33/34ft Nautaline that sank during hurricane Irma last year. I am restoring it but having problems with shore power. I have four circuit breakers coming from a single GFI shore power source. The shore GFI keeps turning off each time I open a circuit breaker except one. The one circuit that works is a hall/bath light switch. I am assuming there is a separate circuit for each of the two AC's, another for the outlets and perhaps a fourth for interior lights? Do you know better? I have 4 outlets. One under helm, one under galley, one in microwave opening and one in bilge. Do you know of any others? I have replaced three of these and disconnected the other. Anyone know of other outlets? Does anyone have a wiring layout for the 33.34 ft. Nautaline? We have a 1972/34' Nautaline and love it. We are in need of the fresh water pump near the holding tank and the port side cover for the bathroom vacuum area. The one that you remove to have holding tank pumped. Anybody got these? I bought a 1974 43" Nautaline. The stringers and transom were totally rotten, and had a lot of rot around all the windows. We pulled the Ford V-8 engines and are adding two 150hp outboards. Please follow the link to watch our remodel on you-tube. We are now 80% complete! Hi, we have a 1973 Nautaline which hasn't been run in twenty years. Its been remodeled on the interior but the catwalks are in bad shape. Also the plumbing is a mess. I have no idea where to start!! My husband and I lived aboard for 9 years year round. I would be there still if my husband hadn't passed. We had a 1974 and he gave her TLC. I'm having to sell her now, and it breaks my heart. We have had our Nautiline 34' for two years now. She had already had her inboards stripped and is now powered with a 150 Mercruiser. We have completely stripped her inside and have finished with this project by @ 90% now, still a few small tasks to complete. I did install an electric head with it's own water source (installed a 15 gal. upright tank with a shut off so we can fill it as needed. All of the safety railing up top is there and works great; however, someone removed all of the bottom railing. I thought I could find a donor houseboat to get the railings, but no luck. Appears I will have to make them myself. There was a couple bad leaks I had to trace down. Both leaks were in the bow section and would wet everything in the berth. Pulled the rubber from the rubrail and they had used regular screws that had rusted out, leaving holes...fixed now too! Nautaline houseboat shipped to UK? Hey everyone.... I found one, a 43ft Nautaline houseboats on eBay for 500 dollars. It has no engines and needs restoration. I would really like to buy this boat and ship it to the UK. Anyone know how much (approximately of course) this would cost me? Love these boats and have seen NOTHING like them in the UK. I would love to live on one. We bought our boat in key west florida. Had to add an outboard and steering to an inside helm. Still need to get upper helm operative. Also rebuilt the catwalks, relatively easy so if you need help contact me. We haven't done much to the inside, at this point it works for us. I am trying to understand the mechanical systems since almost everything has been stripped out of the boat. We were ready to launch but the day before I fell off the boat and broke both my heels. Put an end to walking for a couple months. We love the boat and are very eager to launch. If I can help anyone or if anyone can help me I am open. I need front and rear railing and help with the color coding of the wiring. 1979 or 80 - 43 ft Nautaline. There is no easy way to getting underneath. Stripped a 34 from hull to roof and modified a bit to make it a little easier but at best it is not easy. We choose to make that area for Grand-kids. Because of fire safety concerns such as a fire aft. Also cut an opening in the console panel under the wheel and made a snap on cover. This allows better ventilation as well as an emergency exit. I have the 43 foot version and flat love it. The two 318's and Dana drives make this old girl haul. Parts are parts you can find any part you need without to much effort. Always get compliments on the boat. Classic style just can't be beat. We have a 48 foot Nautaline based north of Toronto on Lake Simcoe and having problems now with catwalks deteriorating. Can anyone send me some info on how to rebuild them. According to some articles published the catwalks were added later at shipping destination in order to give the customer a wider beam. They are completely separate from the fiberglass hull. We moved the gallery to mid-deck with the helm station, and eliminated bath tub, and use the center access under the mid deck refrigerator. This allowed for an open format for the lower deck to do a motel sink in open and pot in enclosed area on port side, stairway is starboard side, added new double sliding door at mid deck next to the helm. There's only 2 of us, so it works well. Doing the lower berth using a captain's bed with 12 drawers underneath as it helps a lot with storage. The houseboat trip home was 250 nautical miles, it took 8 days and 3 breakdowns later, we made it home to our dock. After such a big trip, we now know what has to fixed. We traveled the ICW on the GULF side from the Manatee River to Fort Myers then into ICW and on to our dock at the north end of Lake Okeechobee on Taylor Creek. We redid the engine room, installed a swim platform, and twin Yamaha 115 hp 4 strokes. It gets great gas mileage and now we can renovate the interior. Hi all, we just bought one of these Nautaline houseboats and am looking for fellow owners. We are on Lake Chambers. The previous owners have taken really good care of this one, but does appear to need some AC work on the inside. When it come to houseboat parts, I have some shifter and throttle cables etc, also outdrives (very powerful) that I no longer require. My Nautiline is dry docked in Toronto harbor. Get in touch if interested! Rebuilding and planning to live on for a couple of years with wife and two kids. I have some stringer rot, most rot around leaking windows. Looking for info on where to order replacement shifter cables and throttle cables, if some one can help with this info. Boat located on Lake Thermond, Georgia used to be called Clarks Hill Lake years ago. Gang ways were extended out by previous owner from 12" to 24" and have a slight sag to them, was wondering if this is normal or maybe they were never intended to be extended out? Thanks for any info or comments, Charles. I own a 1970 Nautaline houseboat that I am dismantling...if you are looking for hydraulics, outdrives or anything that moves the boat, except for the engines, I am selling these parts. I am located in Toronto, Canada. I also would love to connect with the person who totally rebuilt the Nautiline and lives on it year round...please contact me! Have a 1973, 48' Nautiline and rebuilt it entirely in 2002, 2003. Have been living aboard ever since winter and summer and love it. The stringers were rotten so when I say rebuild, I mean it. All 5 stringers front to back, ripped out all walls, re-fiberglassed all walls from gangways down and repaired upwards, reinforced all ceiling. Did all new plumbing, electrical, and mahogany finishing. Did almost all work myself and spent about 40-50k. Was a massive job, wouldn't recommend it, but once you get started it seems to just go and go worth it in the end. Just bought a 1978, 48 foot Nautaline houseboat, and it is great. It has twin V8 454 engines, and is very fast, and in great shape. Great boats and I ran one at 40 MPH on the Mehkong river in Laos for the Tom Dooley medical group. It had some souped up Mercs with big three drives. We had A FULL MEDICAL LAB ON BOARD WITH XRAY TOO! I am looking for a 34 footer in the Florida area.